"The touch of an infinite mystery passes over the trivial and the familiar, making it break out into ineffable music…The trees, the stars, and the blue hills ache with a meaning which can never be uttered in words." "Julie Montgomery creates elegant images of trees and sky and sea that seem to shimmer beneath her meditative gaze. Then she inscribes gentle, elusive texts over them, whispered phrases of human presence responding to the landscape. Erased, obscured, and evocative, the words comprise painterly palimpsests; viewers are compelled to fill the ellipses in order to construct meaning." "However rubbed, washed, and scraped, the images in these paintings refuse to disappear--just as nature resists all of our insensate attempts to obliterate her. Instead, Montgomery’s ethereal forms emerge as diffused veils of jewel-like color. Adumbral jade green, lusty garnet red, or regal jasper brown, they recall the treasures hidden deep within the planet’s core and seem to imply that what we see here above the horizon is merely an emanation of the earth’s interior light." "Critic Arthur C. Danto argues that what makes something art is its use of rhetorical (and generally metaphorical) ellipsis. Viewers participate in the co-creation of the artwork by filling in the gaps generated by such ellipses. If everything is given—if the landscape is reproduced in painstaking scientific detail—it is not art for Danto. Nor is it art for Montgomery, who presents but does not describe, implies but refuses to insist. Subtle and suggestive, her hazy curtains of trees and hills and sky coruscate under the barely perceived calligraphy." "Encountering Montgomery’s paintings is like staring out across the fog-covered Pacific and seeing the Channel Islands revealed as the ocean mist lifts on a sunny Santa Barbara day. Gazing westward, we know the islands are there, even when they are obscured by haze. Contemplating Montgomery’s art, we know the poetry is there, but the elegant erasures and ellipses force us to look further, to look deeper, to look within, in order to perceive the shifting strata of meaning." "In the paintings of Julie B. Montgomery now at Caruso Woods Gallery, one detects a distant ripple to the aesthetic gospel according to impressionism, set in the service of a personal vision. 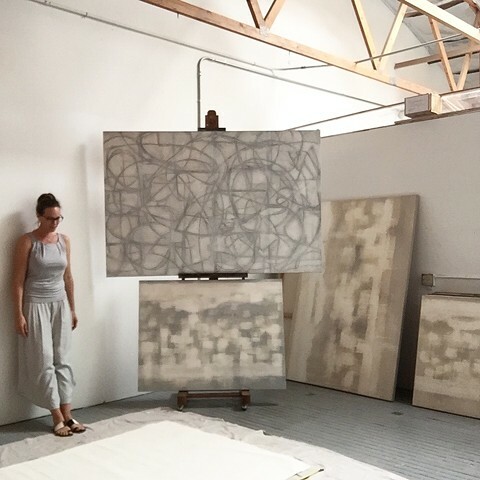 In her sensual and visually massaging pieces, canvases operate at an interesting juncture between abstraction and pictorial allusion." "We sense a connection to the known world, but as seen through the perceptual gaze and filter of a style that softens edges and reduces real world elements to discreet forms swimming in some cosmic middle space. Hers is like a squinting take on the world of light and dark forms we live in, via an ultra-soft focus offshoot of realism. Or, if you like, she's an abstractionist with more interest in pure visual sensation than the outside world. Either way the art works, and woos." "Montgomery's canvases come in assorted shapes and sizes (emphasis on "shapes"). Larger canvases in the gallery include the innately cool "Blue Evolution" and "Grand Ochre" with its scrubbed golden aura and seeping drips emanating from the seemingly overheated objects, fuzzily represented." "By contrast, the "Evolution Series" is a mosaic-like set of 18 square paintings, 8"x8", like a set of dream time postcards with all the details rubbed out. Still, we sense ghostly hints of palm trees, wavy horizons lines and figures making their presence known. On the back wall of the gallery, there hangs a triptych called, "Sixth Season" with a mystical wash in keeping with the paintings title." "With the beguiling canvas called, "Metamorphosis in Blue II," which vaguely evokes as assembly of architectural forms set before distant mountain contours, the palette expands from Montgomery's typically more two-tone approach to each piece. The broader color spectrum is only subtly more dramatic, but subtle changes and variations make an impact when the aesthetic code is so carefully and successfully tended." "Little things matter in art with such quiet, contemplative dignity. In the end, Montgomery's art achieves a transcendental effect by establishing a connective bridge between the artist, the world and the viewer, and the sure but mysterious spaces linking them." "The paintings of Julie Montgomery capture the landscape of elsewhere. Through veils of color, forms are built, but never fully defined. Light permeates, but remains ephemeral. It is as if one is looking at a reflection that could be erased were a wind to come along. Painting for Julie B. Montgomery is as much a reductive process as it is additive. Thin washes are applied and subsequently scrubbed away to reveal figures and places. What remains recalls the work of Helen Frankenthaler, the Impressionists and Chinese landscape paintings yet reflects the artist's singular style and process. True to her nature, Julie Montgomery explores spirituality and beauty while creating a space for one to reflect on where real life lies." "The magic in Julie Montgomery's paintings is like that of poetry. Her subtle, warm palette of layers added and removed from the canvas, have a power that is felt long before any literal information is taken in. They bring to mind something Jorge Luis Borges said about poetry, "I know for a fact that we FEEL the beauty of a poem long before we even begin to think of a meaning." These paintings unveil themselves slowly, akin to the work of JMW Turner where the eyes have to adjust before all the subtle detail can be taken in."